hahahaha designer slip and slide. Love it! It would cost you a pretty penny, but hey, why not. I wonder if my Boss will send me some of this to make her something out of (I think she secretly wants that Slip 'N Slide for herself)! The fabrics look even gorgeouser laminated! Sewer, do you want some? This is great news, indeed! 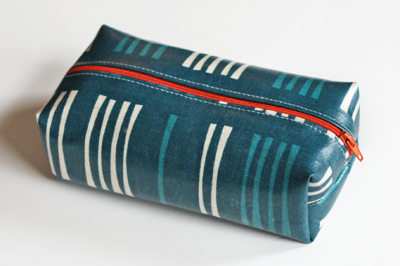 I have wanted to make a few projects from oilcloth, but couldn't find any fabric I liked enough to buy. Now I have no excuses! Some of these would make the greatest tablecloths. My mom and I have been searching for pretty oilcloth that doesn't have anything to do with Italy, France or florals, and it doesn't really exist. So this is awesome. Yay! I've been searching the internet for a year trying to find laminated fabric to recover my beautiful-yet-child-stained-non-laminated-amy-butler-fabric. Seriously I am so excited!!!! Hurrah, Jess! Infinite possibilities!!!!! Must start saving money. You know what would be a fun challenge? To make something that is not table linen, a bag (of any kind), a splat mat or an apron. I know! Raincoat! Umbrella! Galoshes! Motorcycle upholstery! Be still, my heart. Please make me a Vespa with an Oslo seat! I would die. You can make a Vespa, can't you? You're crafty like that. Looks great! Do you know what it's laminated with? Is it PVC? I haven't the foggiest. You can contact The Needle Shop and find out, though. oOooOO... placemats to match my seats? Is that taking it too far? And boo! Why am I in St Louis this weekend when so many fun things are happening in Chicago? Sorry, I don't do Vespas. I make Harelys in my spare time, though. Sigh. I wish I HAD spare time. Well, Harleys are really too loud for my taste, so I guess I'll pass. Thanks anyway, LiEr. "Harelys", Jess! Y'know, the kind for rabbits! I think they're very quiet! And probably made out of cardboard. Of course cardboard! And no, Grandma G - I meant Harleys. My fingers can't spell to save their lives. Although, back to the main point - seriously, I would LOVE to upholster a Vespa in O.O., if I had access to one (and the permission to tinker with it). Uh, I mean a Vepsa. Is there any retailers in Canada that sell your oil cloth? Nope, it's only available from The Needle Shop right now. But they ship internationally. Beautiful! Love it! 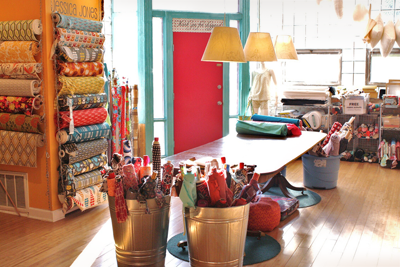 Say, I had a sighting of some aprons made with your fabric at Kreatalier in Providence! The fabrics look great laminated! Congrats! 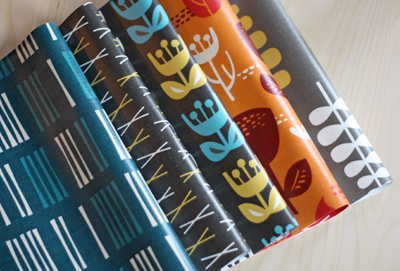 I have a crazy love for cool oilcloth fabrics, and yours are some of the coolest--and SO gorgeous! 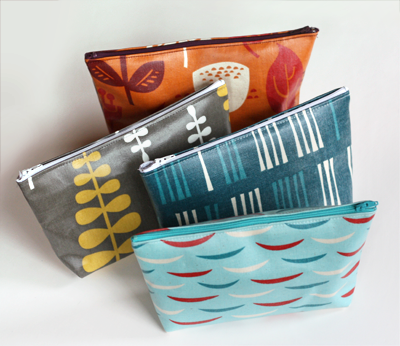 I can't wait to get some and make myself a few zip pouches to carry in my daily life! That is really a neat way to make something out of these gorgeous patterns, just what we needed! I do NOT know how I missed this! It's gorgeous! Thank you so much for the inspiring Quilt shop picture! I recently lost my business but my next quilt shop is gonna have some part of the spirit I see on your site:) Thank you!